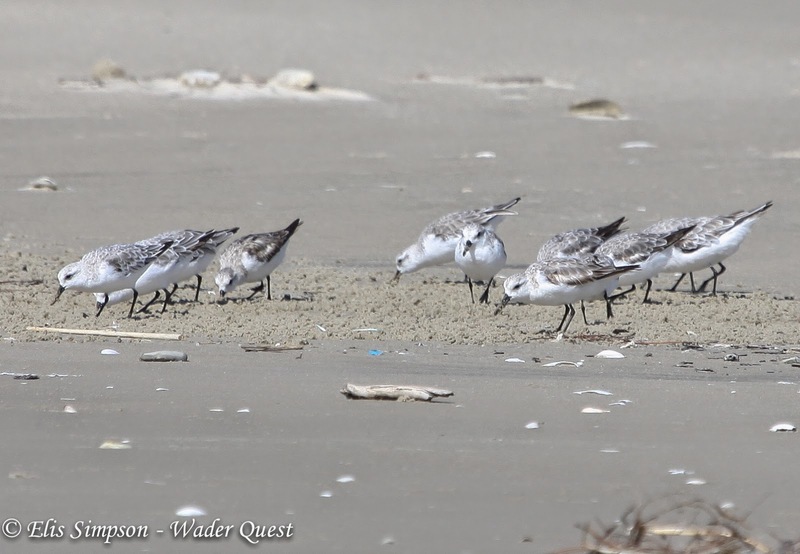 Following the summary of migrating plovers from the Americas, here is a selection from the classic wader group, the Calidrids. 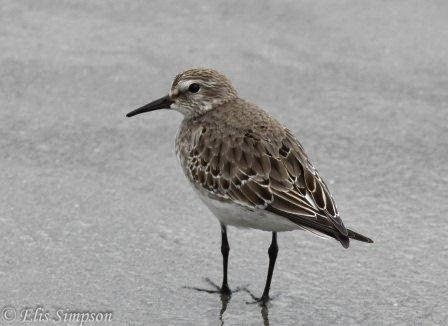 The members of this genus that travel from North America to winter in South America are; Red Knot, Sanderling, Semipalmated, Western, Least, White-rumped, Baird's and Pectoral Sandpipers. Red Knot Calidris canutus; Least concern, global population estimated at 1,100,000 individuals. Global population trend declining, American population crashed and it may be categorised as threatened in the USA, average peak numbers recorded at Delaware Bay from 1986 - 95 were 46,000, from 1996 - 2011 that average is now 26,000. Among these the Red Knot is the champion migrant. 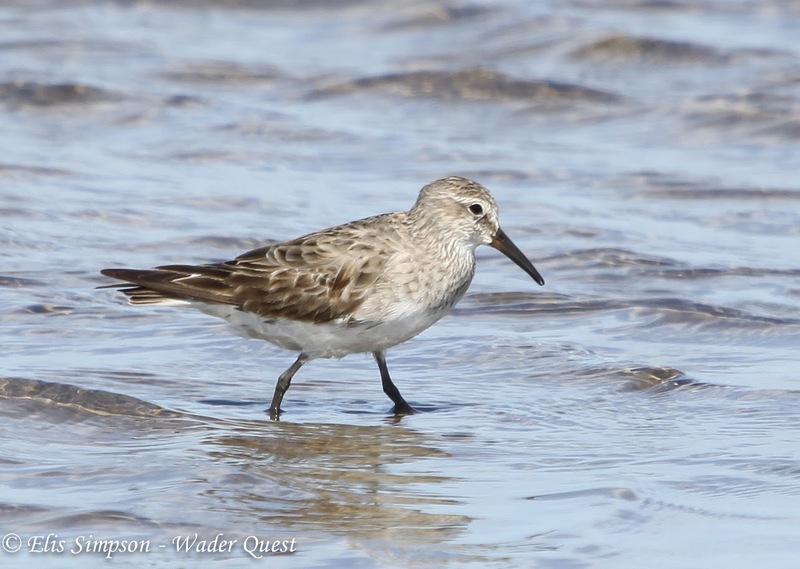 The American race Calidris canutus rufa makes a journey of over 9,000 miles each way. It travels for long distances with few stop over points in between. This reliance on few stopover points has been its downfall. When you rely on just a few places you are in big trouble when they become compromised. In the Americas this species has shown a steep decline. 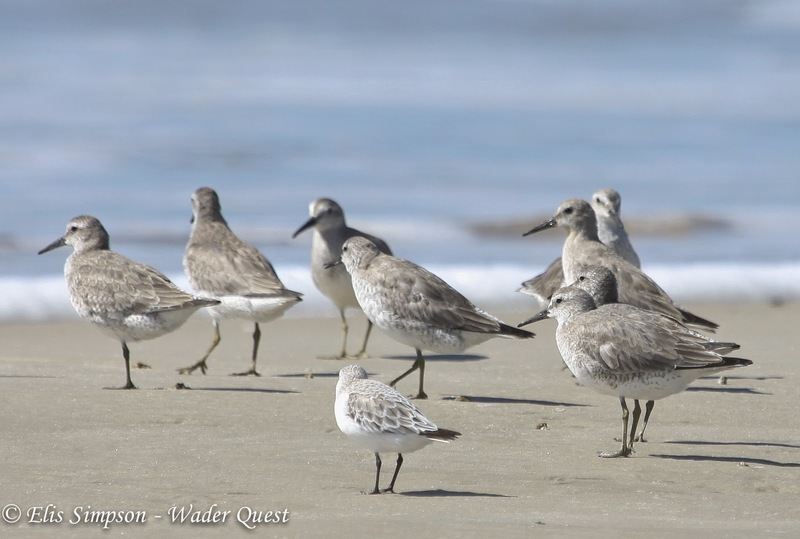 One of the reasons for this was the depletion of the horsehoe crab stocks in north-east USA upon which the Red Knots depended to refuel for their spring migration. Control over the use of this 'resource' for fishing bait has led to an improvement in the species fortunes but they are far from being out of the woods yet. Red Knot Calidris canutus rufa with sngle Sanderling Calidris alba; Adult non breeding birds but the bird on the left is probably a first winter bird showing some dark edged juvenile coverts where the pale tip has worn off. Taveres, Rio Grande do Sul, Brazil. October 2013. 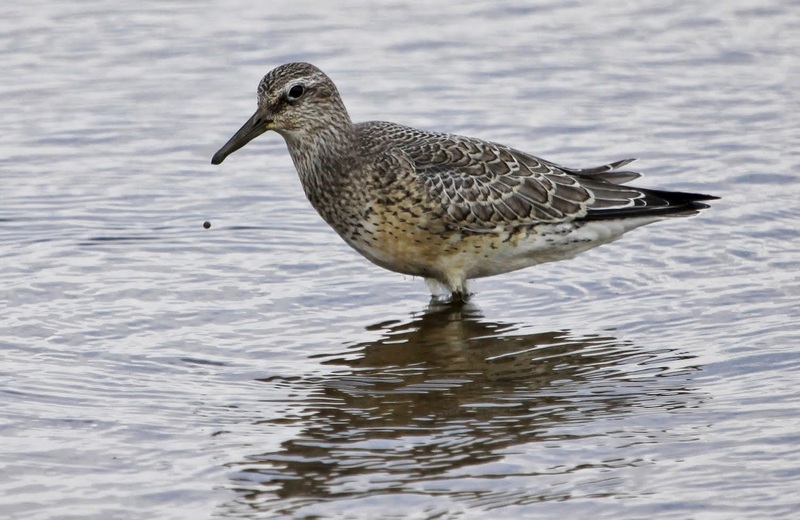 Red Knot (rufa) breed in the Canadian Arctic and when they migrate they do it in hops of up to 1,500 miles at a time and winter in South America, some in the north-east but the majority fly on down to southern Argentina and central Chile. Birds wintering in Florida are thought to be of the race C. c. roselaari which breeds in western Alaska. Red Knot Calidris canutus rufa; In transition from non-breeding to breeding plumage. Galveston, Texas, USA. April 2013. I have included a photo of another race here, probably islandica to show the rather attractive juvenile plumage. Red Knot Calidris rufa islandica; Juvenile, Titchwell, Norfolk, England. August 2012. Sanderling Calidris alba; Least concern, global population estimated at 620,000 - 700,000 individuals. Global population trend stable, American population decreasing. Sanderling Calidris alba; In winter plumage, Tavares, Rio Grande do Sul, Brazil. Ocotber 2013. Sanderling Calidris alba and Red Knot Caldiris canutus (behind); both in adult winter plumage. Tavres, Rio Grande do Sul, Brazil. October 2013. 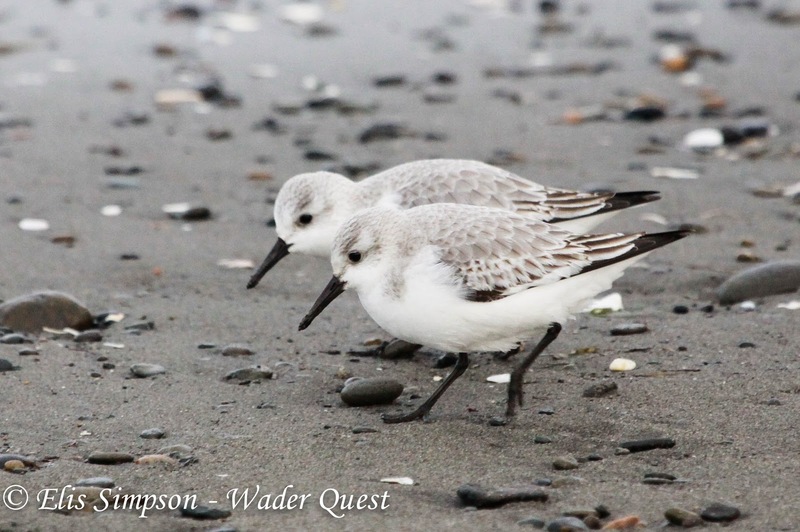 Sanderling breed in the Canadian Arctic with a small population in northern Alaska. They winter widely along the coasts of North, Central and South America and Caribbean islands. Sanderling Calidris alba; Breeding plumage. Galveston, Texas, USA. April 2013. 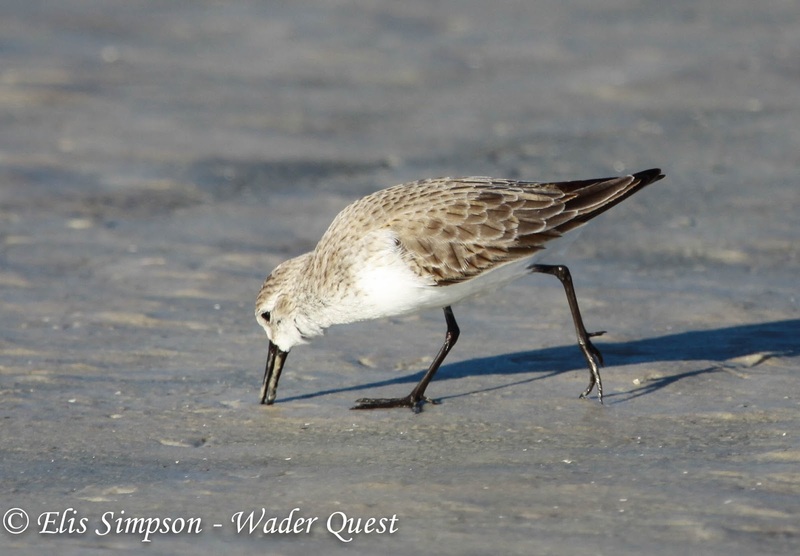 A well known and common species which migrates offshore or along both the Pacific and Atlantic coasts for the most part but does also take overland routes via the prairies and Texas coast. Some first year birds remain in South America all year but many return to the breeding grounds. Sanderling Calidris alba; 1st winter birds with adult wnter plumage on the back but with juvenile coverts and tertials. Ocean Shore, Washington, USA. December 2012. 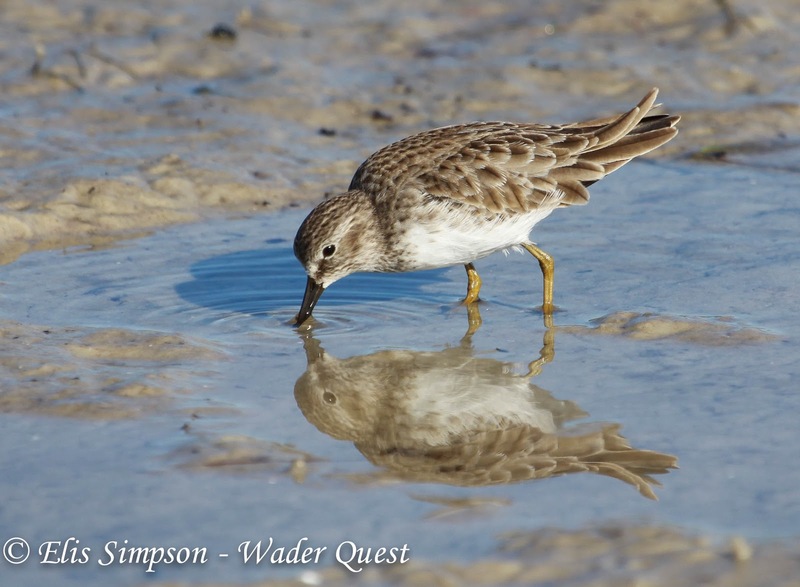 These are familiar birds to most birders who enjoy watching them scurrying along at the water's edge. An adaptation to their lightness afoot is the lack of hind toe, they are the only Calidrid to display this feature, so if you have a small wader you are not sure of with black legs, check for the hind toe, if it doesn't have one, it's a Sanderling! Semipalmated Sandpiper Calidris pusilla; Near Threatened, global population formerly estimated at 3.5 milion individuals but revised downwards to 2.2 million in 2006. Semipalmated Sandpiper Calidris pusilla; Breeding plumage. The evening light makes this bird look more rufous than normal. The hind toe on the left foot appears to be missing but is clearly visible on the right foot. Milford, Connecticut, USA. May 2012. Breeds across northern North America from west and north Alaska across throughout northern Canada. It winters along the Atlantic coast of South America north from central Argentina up to the Yukatan Peninsula in Mexico. On the Pacific coast south from Mexico to Peru. Semipalmated Sandpiper Calidris pusilla; Galveston, Texas, USA. April 2014. Another species that makes long flights up to 4,000 km. They gather in large flocks at key stopover points which makes them vulnerable despite their high numbers. If there were to be a huge oil spill for example a very large percentage of the population could be affected in one incident. 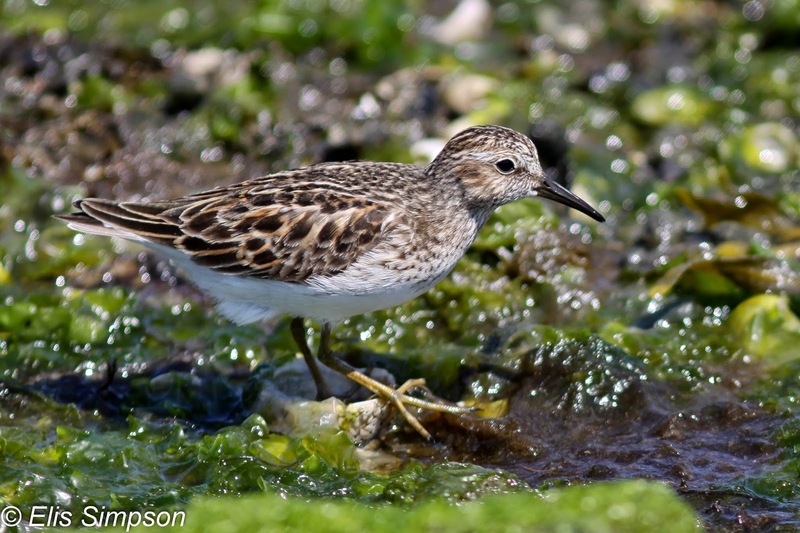 Semipalmated Sandpiper Calidris pusilla; Transition from non-breeding to breeding plumage. Galveston, Texas, USA. April 2013. Birds from Alaska move south across the Great Plains, the birds in the centre of their breeding range move south across James Bay, Bay of Fundy and west Atlantic returning across the Caribbean and the Gulf of Mexico and then across the Great Plains. The eastern population in Canada flies straight across the Atlantic to the Caribbean returning along the Atlantic coast. It is said that two thirds of the juvenile population remains on the wintering grounds during their first breeding season and some may not breed until their fourth year. 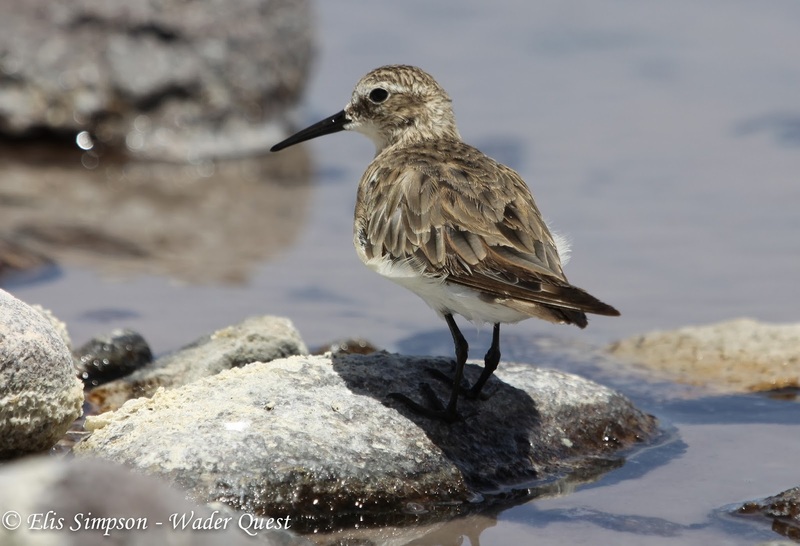 Western Sandpiper Calidris mauri; Least concern, global population estimated at 2,000,000 - 3,000,000 individuals. Global population trend declining. Breeds in a relatively small area in western Alaska and the eastern Chukotskiy Peninsula in Russia. It winters along the coasts of north America on both the Atlantic and Pacific sides from the USA south to Peru and Surinam and across the Caribbean. Females tend to migrate further south than the males. Western Sandpiper Caldris mauri; non-breeding, Biscayne, Florida, USA. November 2012. They leave the breeding grounds in July or August and unlike some other Calidrids they migrate in small hops of around a maximum of 600km rather than long flights. They return to the breeding grounds in May to mid-June. 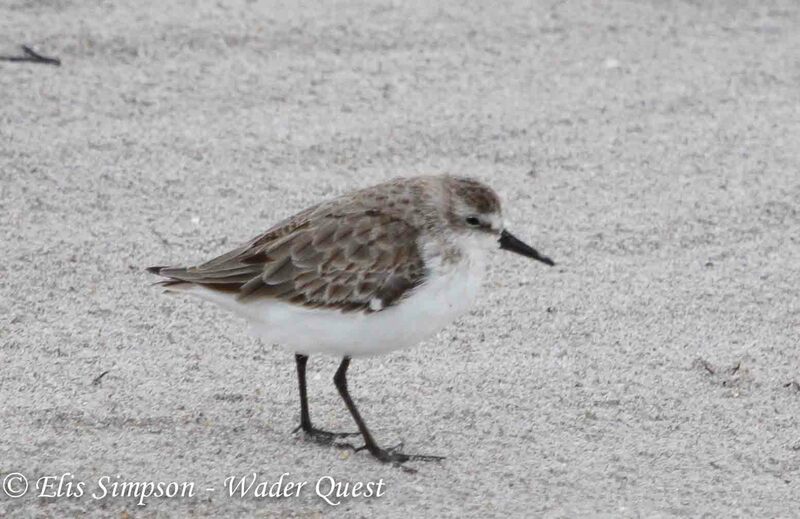 Western Sandpiper Calidris mauri; Dark tertials are probably retained juvenile feathers suggesting first winter bird Bunche Beach, Florida, USA. December 2012. Least Sandpiper Calidris minutilla; Least concern, global population estimated to be 100,000 individuals. Global population trend declining. Breeding across northern North America from Alaska to Nova Scotia and unlike other Calidrids winters away from the coast inland as well as along the coasts from central USA south through Central America and the Caribbean to central South America. They leave the breeding grounds from June to mid-July the adults leave first followed by the juveniles and males precede females. Least Sandpiper Calidris minutilla; Bunche Beach, Florida, USA. December 2012. On the return north males arrive in April before the females which in May, the birds on the west coast moving earlier than the east coast. Least Sandpiper Calidris minutilla; quite a dull example, transitional between non-breeding and breeding plumage. Westport, Connecticut, USA. May 2012. White-rumped Sandpiper Calidris fuscicollis; Least concern, global population estimated at 50 - 100,000 individuals. Global population trend unknown but possibly declining. A very long distance migrant, nesting far north in Canada and north eastern Alaska in the Arctic and winters in the southern half of South America particularly east of the Andes. They leave their breeding grounds before mid August and they fly across the Atlantic Ocean direct to South America with shorter flights then down along the coast. White-rumped Sandpiper Calidris fuscicollis; juvenile starting to moult into first winter plumage. Ubatuba, São Paulo, Brazil. October 2011. White-rumped Sandpiper Calidris fuscicollis; juvenile almost completely moulted into first winter plumage. Ubatuba, São Paulo, Brazil. October 2011. The return route is across South and Central America and then overland across North America arriving on the breeding grounds around mid May. White-rumped Sandpiper Calidris fuscicollis; adult winter. Tavares, Rio Grande do Sul, Brazil. October 2013. 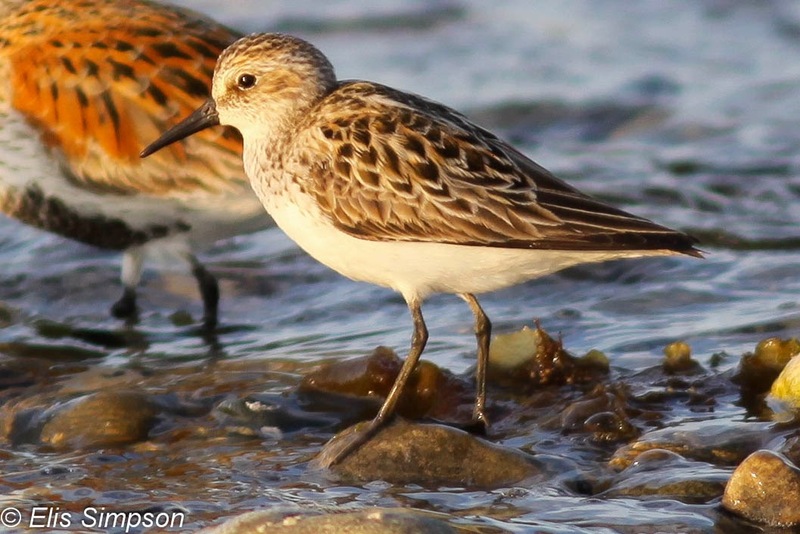 Baird's Sandpiper Calidris bairdii; Least concern, global population estimated at over 300,000 individuals. Global population trend stable. Very similar in many ways to the previous species. It looks very similar with long wings extending beyond the tail and they are often very hard to tell apart. 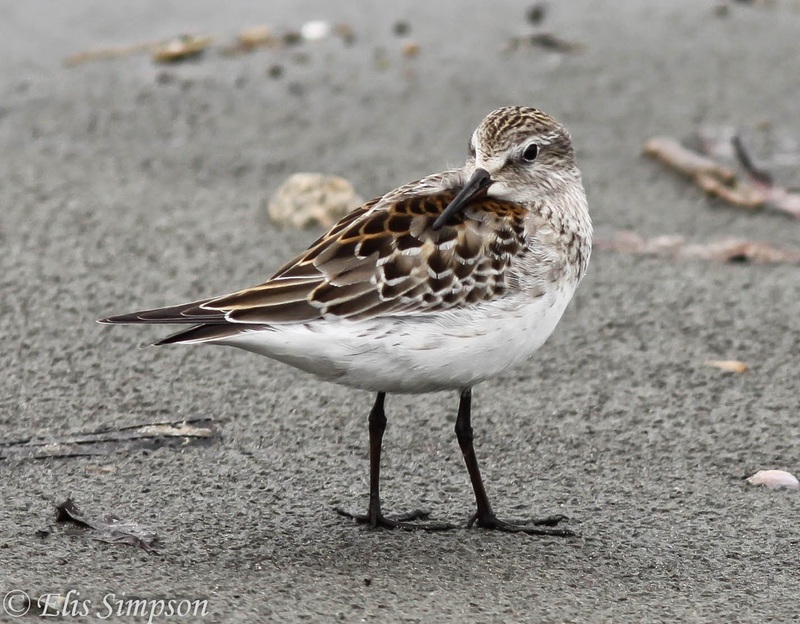 The breeding range of this species is also similar to, but slightly more extensive than, White-rumped, Baird's breeding further across northern Alaska to the west coast. Baird's Sandpiper Calidris bairdii; Dark and brownish breeding plumage upperparts. Punta Arenas, Magellanes, Chile. November 2013. Their southerly migration however differs from White-rumped taking an inland route through North America and not out across the Atlantic. From the prairies they then fly non stop to the Andes and winter from Peru down the west coast to Tierra del Fuego and across Argentina to the east of the Andes again south to Tierra del Fuego. The adults leave in early June and the juveniles follow in July. The return journey follows the same route in reverse. Baird's Sandpiper Calidris bairdii; much greyer winter plumage upperparts. Laguna Chaxa, Antofagasta, Chile. November 2013. 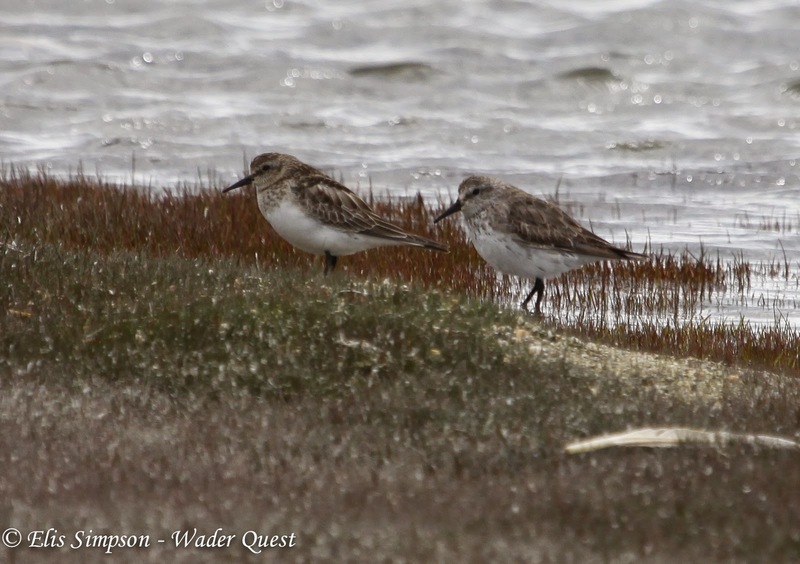 Although the Baird's and White-rumped Sandpipers look very similar, side by side they are not so hard to distinguish when a direct comparison can be made. Baird's Sandpiper Calidris bairdii (left) and White-rumped Sandpiper Calidris fuscicollis; Useful comparison of the two very similar species. Note the browner tone of the Baird's and the unstreaked flanks and the bill is finer tipped. Laguna Verde, Tierra del Fuego, Chile. November 2013. Pectoral Sandpiper Calidris melanotos; Least concern, global population estimated at 25 - 100,000 individuals. Global population trend stable. 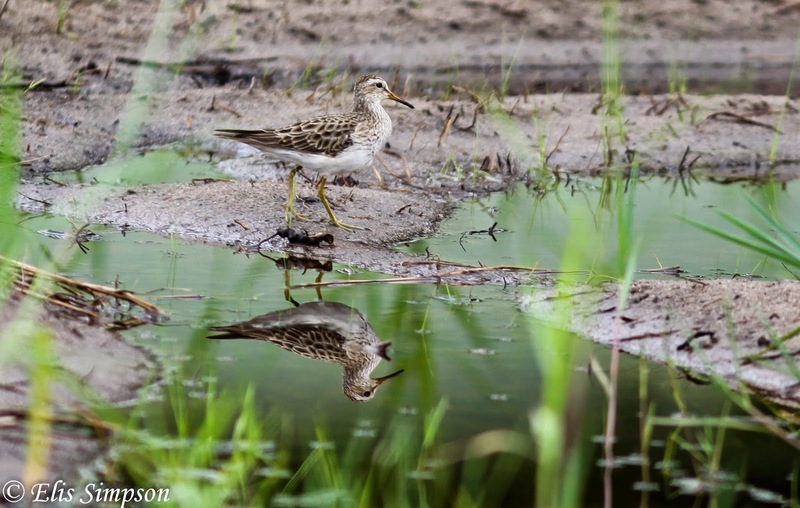 Pectoral Sandpipers are much less restricted to the Americas than the previous examples. They breed across northern Canada and in north and west Alaska then right across northern Russia. Like the previous two species they winter in the southern cone of South America. Pectoral Sandpiper Calidris melanotos; juvenile showing small rufous fringed scapulars. Ubatuba, São Paulo, Brazil. October 2010. The southerly route in the Americas takes them down both coasts and then through the highlands of Colombia and Ecuador from late June (males) to August (females) the juveniles following after this. The northerly migration is from March to early June and through the interior of North America. Pectoral Sandpiper Calidris melanotos; non-breeding. Ubatuba, São Paulo, Brazil. January 2012. Birdlife International (2014) IUCN Red List for birds. Downloaded from www.birdlife.org on 10/04/2014. Chander, R. (2009) Shorebirds of the Northern Hemisphere. A&C Black, London. del Hoyo, J., Elliott, A. & Sargatal, J. eds (1996) Handbook of the Birds of the World. Vol3. Hoatzin to Auks. Lynx Edicions, Barcelona. Wildlife populations: Red KnotPage 1 updated 7/2012. Environmental trends ReportNJDEP, Office of science. 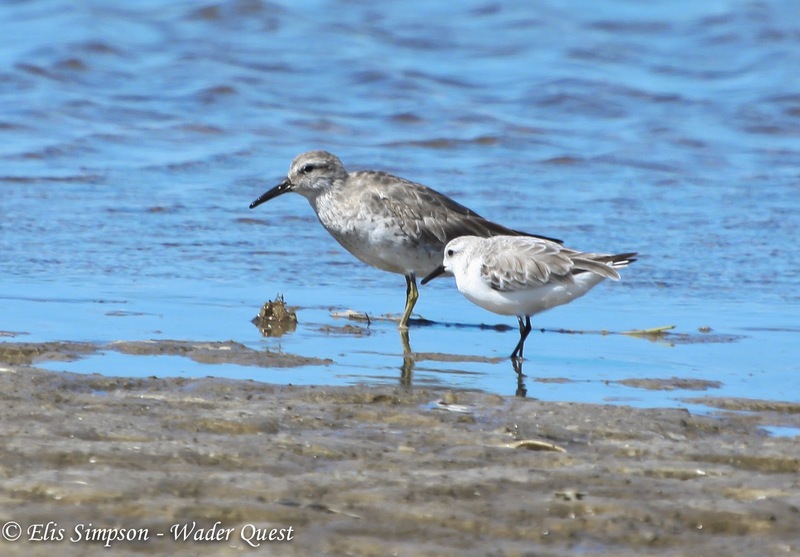 www.nj.gov/dep/dsr/trends/pdfs/wildlife-redknot.pdf downloaded 09/04/2014.